"Empowerment, Healing on all Levels of Being"
Combine a low budget, restful vacation in a beautiful, peaceful, spiritual ambiance in a distant country with Reiki Master attunement and healing on all levels of your being! "Our mission is to assist our group members in tapping into the Field of Unlimited Possibilities to expand perception and manifest well-being, and realize your potential on this journey which we call “life"
If you wish to become an empowered instrument of transformation and receive phenomenal healing on all levels of being, we invite you to a 2-week Body/Mind/Spirit “AWE” retreat in the extraordinary energetic environment of the "Casa de Dom Inacio de Loyola" in the small town of Abadiania, GO (65 miles west of Brasilia). Path to the "Soup Kitchen"
Abadiania has an unsurpassed ambiance of spirituality and healing. 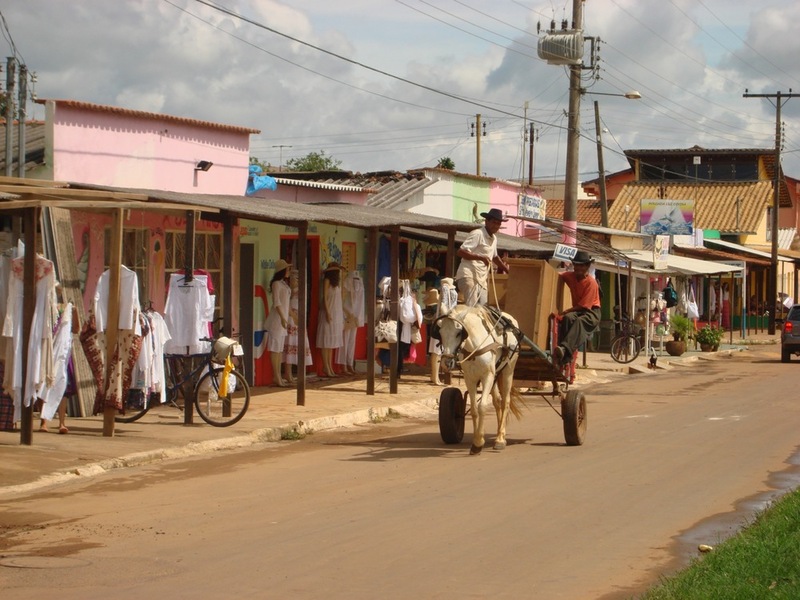 Over the past decades, more than ten million people traveled to Abadiania to experience the work of many hundreds of benevolent Spirit Entities at the Casa de Dom Inacio de Loyola, a center promoting well-being and wholeness, located in the smaller, northern section of this town of 20,000 inhabitants. Countless transformations occur at this “spiritual hospital,” including miraculous cure of cancer, AIDS, paraplegia, blindness, and of many other serious or seemingly "incurable" illnesses. Credit is given to God, who in infinite goodness allows these benevolent spirits to do their work on all who seek help. The Retreat will have two parts: One is an in-depth presence at the Casa de Dom Inacio de Loyola, which is open on Wednesdays, Thursdays and Fridays with “Current” (meditation) sessions and other programs to personally initiate healing manifestations for self and others. The Casa program includes crystal bed sessions (at modest extra charge), the legendary delicious blessed “Casa”-soup and visits to the sacred waterfall — all on personal initiative and request of the traveler. As second program part, we now offer our AWE Retreat, including in particular Reiki 1and 2 training and Master attunement, as an integral element of the two-week program in Abadiania, This is a distinct addition to the program we offered at our previous travels to the Casa de Dom Inacio. It is commensurate with the re-emergence from dramatic third-dimensional changes that have occurred at the Casa the Dom Inacio in December 2018. We invite you to read up on these changes by pressing here or the button below. On Main Street in Abadiania. People often ask, "Why should I go to far-away Abadiania -- I am basically healthy and in good shape?" You will benefit on all levels of your being. Sick or healthy at the time when you arrange for this travel, you will be in a better place when you return -- physically, mentally, emotionally, and spiritually; in your relationships, life goals, getting clarity about your deeper purpose, transforming your daily life, tapping into your innate creativity. Yes, we have witnessed numerous miraculous physical transformations that occurred In Abadiania. And we have also found that travel to Abadiania, in all its modesty, bears impacting rewards in all areas of life, like no other destination we have traveled to in this wonderful world. Visitors to the Casa de Dom Inacio have included medical doctors, scientists, priests, theologians and people from all walks of life and all religious beliefs. Many have experienced illnesses considered incurable by Western medicine standards. Everyone receives healing; but physical cure is, of course, not guaranteed. In 2006, we were invited to be "Son and Daughter of the Casa de Dom Inacio" and to be "Casa Group Leaders." Press here to read more about why Abadiania is so special to us, and why we return year after year and take groups there. Having visited Abadiania in aggregate well over 120 weeks, we allow ourselves, and those traveling with us, to be guided by the simple, spiritual atmosphere around the Casa. Our retreat participants stay in their choice of accommodations in town. We will help with this. The lodging rate typically includes buffet-style breakfast, lunch, and/or dinner -- inquire for details. Food is excellent and healthy and meets the requirements of vegetarians, but also offers plenty of variety of meat and seafood for those of us who prefer a diet rich in protein. Participants will typically arrive on a Monday, to have extra time to "acclimatize" themselves to the "Abadianian way of life," visit the grounds of the Casa de Dom Inacio de Loyola and browse the modest boutiques in town, and perhaps enjoy a coffee or the famous Brazilian Acai (an iced soft drink made of super-healthy and tasty fruit from the Amazon region) at one of the cafes in town, where you will meet many other foreign "Casa" visitors. The program will begin on Tuesday and includes an informal orientation to the offered “Casa” process during your stay. Wednesday, Thursday, and Friday are then structured around the morning and afternoon sessions at the Casa de Dom Inacio de Loyola, including meditations in the current room, crystal bed sessions, and related other Casa-programs. We will help you design and maximize your experience. The next 4 days (Sat - Tue) are mostly filled with the Reiki Training and attunement part of this AWE retreat, interspersed with free time to assimilate the experience. Then there will be another 3-day Casa experience (Wed - Fri of your second week), with additional "current" room sessions and any of the other program options available at the Casa. In Pirenopolis, 45 min from Abadiania. The participants will typically depart for their return journey on the second Saturday after lunch at their pousada. In order to facilitate the transition to "life out there," we may offer to help arrange for an optional 3 to 5-hour sight-seeing tour to the picturesque neighboring town of Pirenopolis and in the unique capital of our host country, Brasilia, to get an impression of this metropolis, which was designed in 1955 and inaugurated in 1961. They can visit, among other attractions, the architecturally extraordinary cathedral, the stunning "Blue Church," and the famous "Temple of Good Will," before they will depart in the late afternoon/evening for their home flights. 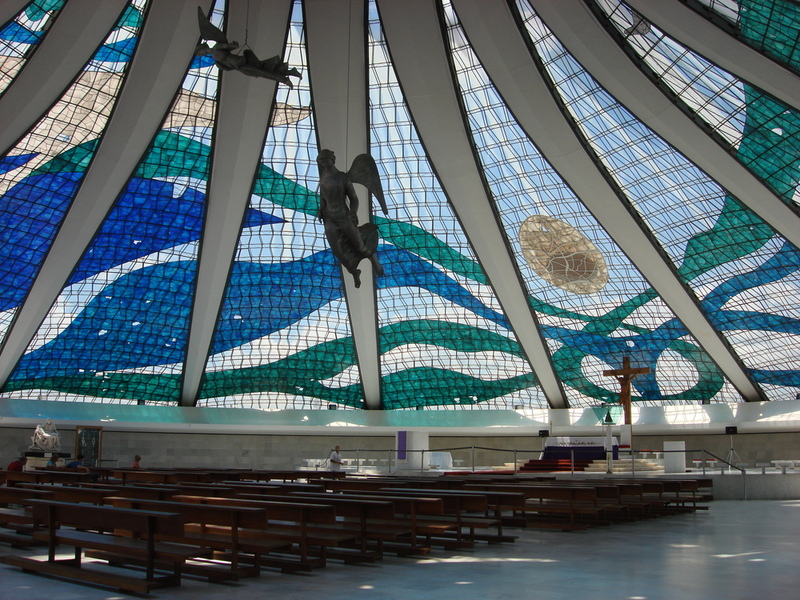 The "Blue Church" in Brasilia. We invite you to join us on such a retreat of transformation. You book (and pay for) your own flights, and we help with your booking of your accommodations and transportation between Brasilia and Abadiania (a 1 1/2-hour taxi or van ride). Travel Arrangements: We advise you when you make your own air travel arrangements, taking you to Brasilia International Airport (BSB) on a Sunday or, preferably, Monday. Direct flights (7 - 8 hours) to Brasilia are available from Atlanta and Miami and will usually arrive in the morning. We will communicate pertinent travel information (such as how to obtain the visa required for American citizens, which can be arranged on-line) to the participants. See here for more details regarding visa. Accommodations are just at a few minutes walk from the Casa de Dom Inacio de Loyola. They are modest but include en-suite private bathroom facilities with shower. We can arrange for de-luxe lodging with superb distant vistas or garden views; some are in an exceptionally energetic and creatively designed style and are generally adapted to European/North American lodging preferences, such as featuring large windows or sliding glass doors, etc. Free WiFi is usually available. We can also assist you with booking preferred de-luxe accommodations and rooms with air conditioning. There is also the possibility of booking de-luxe, air-conditioned apartments with full kitchens. Brasilia Airport Transportation: We will arrange for you to be picked up at the Airport by taxi or private van, and to be taken back to the airport. Casa Experience: We will help you maximize your experience at the Casa de Dom Inacio, advising you with regard to the Casa protocols. Waterfall Experience: We prepare for, and accompany you to the sacred waterfall. Optional Excursion to Pirenopolis and tour to significant sites in Brasilia on the last day of your stay: We arrange for this at very modest additional charge. See here for details. A detailed Manual highlighting the most important aspects about your travel to Abadiania, including the Casa protocol, what to bring and not to bring, etc., will be made available after sign-up. 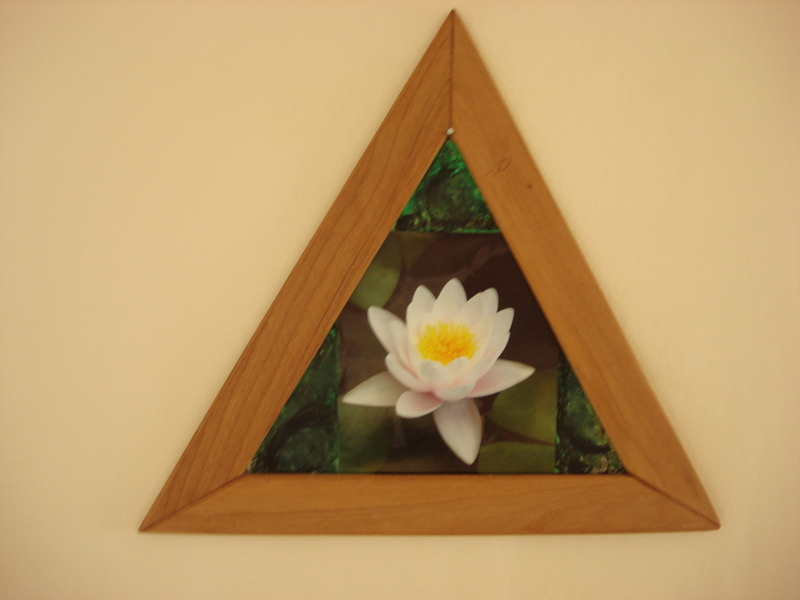 Reiki: The Reiki training will take place in a private home in Abadiania and include elements described here. The fee for our services is US$ 990 for advanced registration (120 days) and US$1190 for registration between 120 and 60 days prior to the retreat date. Air fare, airport transportation and lodging are not included. In addition to taking care of your expenses for room and board (about US$50-90/day, depending on your choice of amenities), you will need to bring extra money for your purchases of crystals and other Casa memorabilia, crystal bed sessions (approx. US$10/session), perhaps a massage (approx. 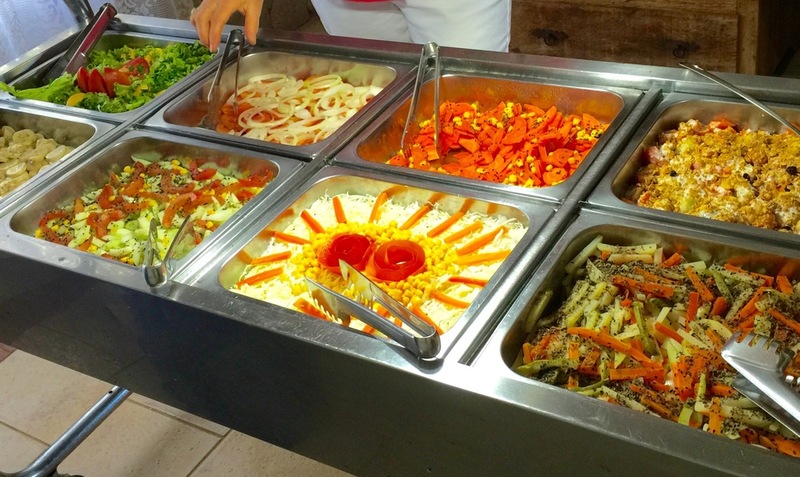 US$30), some purchases in boutiques, the optional excursion to Pirenopolis and/or sight seeing in Brasilia, buying blessed water at the Casa, and -- last but certainly not least -- your desserts and your famous Brazilian fruit drinks at Cafes in Abadiania. Many visitors find the low prices for precious crystals very appealing. For those of you who have only experienced the Casa de Dom Inacio de Loyola Crystal Bed at our house but otherwise know little about the Casa, we recommend reading chapters on healing in Abadiania in our books Expanding Perception (primarily on pp. 113 - 157 ); Orbs, Their Mission and Messages of Hope (pp. 81 - 96); and The Orb Project (pp. 165 - 171). We also recommend Emma Bragdon's book "Spiritual Alliances," and the book "Cosmic Healing" by Barbara Brodsky. We only accept retreat participants who can travel independently and are physically able to care for themselves. Please scroll down and let us know if you are interested in joining us. We will then get back to you with more detailed information. Let us know if you are interested in joining us for a 2020 travel date. If your foreign address does not fit into this format, please include it in the "Comments" box below. If your foreign phone number does not fit into this format, please simply include it in the "Comments" section below. The more information you give us, the better and more specific we can respond.